1. The Historiography of the Society of Jesus: Where Does It Stand Today? 2. The Pastoral, Social, Ecclesiastical, Civic, and Cultural Mission of the Society of Jesus. 4. Was Ignatius of Loyola a church Reformer? How to Look at Early Modern Catholicism. 5. The Ministry to Outsiders: The Jesuits. 6. Ignatius of Loyola (c.1491-1556). 8. 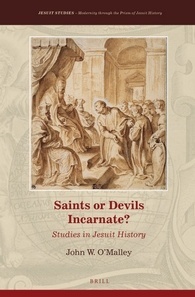 Early Jesuit Spirituality: Spain and Italy. 9. To Travel to Any Part of the World: Jerónimo Nadal and the Jesuit Vocation. 10. Some Distinctive Characteristics of Jesuit Spirituality in the Sixteenth Century. 11. Renaissance Humanism and the Religious Culture of the Early Jesuits. 12. How the First Jesuits Became Involved in Education. 13. Mission and the Early Jesuits. 14. Saint Ignatius and the Cultural Mission of the Society of Jesus. 15. The Many Lives of Ignatius of Loyola: Future Saint.